Alex Jones and Matt Baker are joined by Lady Wilnelia Forsyth to talk about what life was like with her beloved husband, Sir Bruce Forsyth. Browse content similar to 07/03/2018. Check below for episodes and series from the same categories and more! The One Show with Alex Jones. Loads of guests on the show tonight. Let's check they're all here. Stop You have run training. you've got to. No, please. I can do. Thats with a stunt double. didn't do that speed at the end. power of my natural athleticism! closing branches on the high street. different way of doing business. work for the last three months. here. There's not too many of them. There's not many places opening up. preparation for the grand opening. It was quite run down around here. social enterprises in the UK. why don't we run it. at some housing project as well. returning to work after seven years. able to provide for them. happens at home, stays at home. East and causes chaos across the UK. the snow, Mitchel is optimistic. for got one crucial thing. bit and get everybody on board. be down with that, would you? because it's curry. It's sauce. Sauce has ingredients in it. what is in that. A jug of sauce. been mixed up and broken and poured. apple. I know what's in that. lot of them are going through. difficulties we are talking about. think a lot of people don't know. there is a long way to go. out there who health test the dogs. smaller to eliminate the problems. It's such a tricky thing. for life. It's a hard thing to hear. the morning, like a baby. of the UK's best loved entertainers? came out they went Our era was wild. difference. That's what Bruce loved. legend of showbusiness, I'm nobody. to people and they didn't mind. jaw line. So you know. toed to me. Late -- related to me. He was such a good friend. under way for tonight's performance. off to watch from the wings. pressure off a little bit. is on at 9pm on BBC One. A warm welcome to the show. that kind of atmosphere as well. an incredible husband and father. to have them as part of my life. we will watch on Sunday night. know that together we can do it. take on this monumental challenge. physically and then later mentally. to bond with her son. volunteer herself for the challenge. out and she was basically dead. and I knew I had to go see someone. he word MUM to 70205.
the word MUM to 70210.
the word MUM to 70220.
ask the bill payer's permission. Now, the team. Welcome back. challenge still does lie ahead. snow and, Amal, you are ill.
with a cold, it was bad. on and it is still awful. on BBC One next Wednesday. by Hollywood star Susan Sarandon. Alex Jones and Matt Baker are joined by Lady Wilnelia Forsyth to talk about what life was like with her beloved husband, Sir Bruce Forsyth. 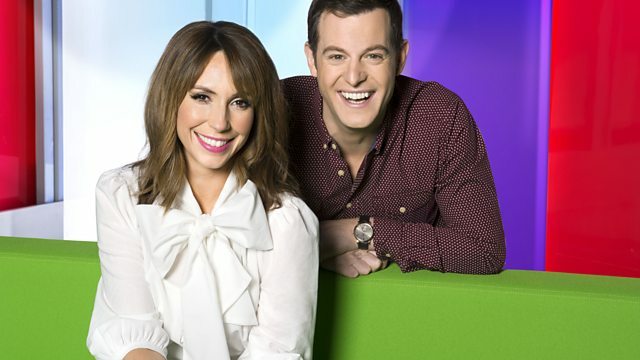 Plus Catherine Tate is on the show to discuss her new documentary Saving the British Bulldog.